This article is about snow skiing. For water skiing, see Water skiing. For other uses, see Skiing (disambiguation). Video demonstration of a variety of ski techniques used in the 1940s. 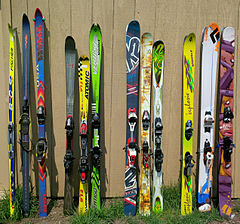 The word "ski" is one of a handful of words that Norway has exported to the international community. It comes from the Old Norse word "skíð" which means "split piece of wood or firewood". Asymmetrical skis were used in northern Finland and Sweden until at least the late 19th century. On one foot, the skier wore a long straight non-arching ski for sliding, and a shorter ski was worn on the other foot for kicking. The underside of the short ski was either plain or covered with animal skin to aid this use, while the long ski supporting the weight of the skier was treated with animal fat in a similar manner to modern ski waxing. Skiing was primarily used for transport until the mid-19th century, but since then has also become a recreation and sport. Military ski races were held in Norway during the 18th century, and ski warfare was studied in the late 18th century. As equipment evolved and ski lifts were developed during the late 19th and early 20th centuries, two main genres of skiing emerged—Alpine (downhill) skiing and Nordic skiing. The main difference between the two is the type of ski binding (the way in which the ski boots are attached to the skis). Also called "downhill skiing", Alpine skiing typically takes place on a piste at a ski resort. It is characterized by fixed-heel bindings that attach at both the toe and the heel of the skier's boot. Ski lifts, including chairlifts, bring skiers up the slope. Backcountry skiing can be accessed by helicopter, snowcat, hiking and snowmobile. Facilities at resorts can include night skiing, après-ski, and glade skiing under the supervision of the ski patrol and the ski school. Alpine skiing branched off from the older Nordic type of skiing around the 1920s when the advent of ski lifts meant that it was not necessary to walk any longer. Alpine equipment has specialized to the point where it can now only be used with the help of lifts. Freeriding skiing – This category of skiing includes any practice of the sport on non-groomed terrain. Originally and primarily a winter sport, skiing can also be practiced indoors without snow, outdoors on grass, on dry ski slopes, with ski simulators, or with roller skis. A treadmill-like surface can also be used, to enable skiing while staying in the same place. 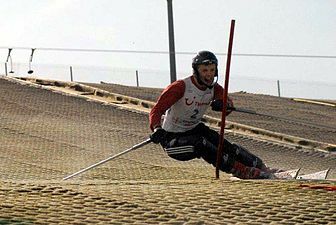 Sand skiing involves sliding on sand instead of snow, but the skier uses conventional skis, ski poles, bindings and boots. A skier with a disability on a sit-ski, using two outriggers. ^ Formenti; et al. (2005). "Human locomotion on snow: determinants of economy and speed of skiing across the ages". Proceedings. Biological Sciences. 272 (1572): 1561–1569. doi:10.1098/rspb.2005.3121. PMC 1559840. PMID 16048771. ^ Editors (25 January 2006). "Ancient paintings suggest China invented skiing". China Today. Xinhua News Agency. Archived from the original on 29 March 2015. Retrieved 27 January 2015. ^ Marquand, Edward (15 March 2006). "Before Scandinavia: These could be the first skiers". The Christian Science Monitor. Retrieved 8 March 2015. ^ Caprona, Yann de: Norsk etymologisk ordbok. Oslo: Kagge forlag, 2014. ISBN 9788248910541. ^ Hergstrom, P (1748). Beschreibung von dem unter schwedischer Krone gehörigen Lappland. Leipzig: von Rother. ^ Saur, Lasse (1999): Norske ski - til glede og besvær. Research report, Høgskolen i Finnmark. ^ E. John B. Allen (30 January 2014). "How concern for the national health and military preparedness led France to build the infrastructure for Chamonix, 1924". International Skiing History Association. Retrieved 17 July 2014. ^ Lizza, Chris I. (1997). "The first dual slalom duel". Skiing Heritage Journal. International Skiing History Association. 10 (3): 42. ISSN 1082-2895. ^ Lipsyte, Robert (2009). Vizard, Frank (ed.). Why a Curveball Curves: The Incredible Science of Sports. Popular mechanics. Sterling Publishing Company, Inc. p. 224. ISBN 9781588167941. ^ "Fastest sand skiing". Guinness World Records. Retrieved 26 March 2018. This page was last edited on 2 April 2019, at 05:41 (UTC).